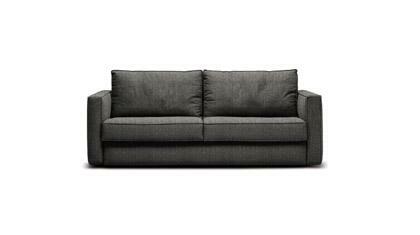 The Michelle sofa bed is available in standard dimensions or can be custom made according to your needs. Shop on-line or in one of our showrooms, our furniture consultants are ready to assist you. Wood supporting frame, wood legs. The padding of the seat and back cushions is made of non-deformable polyurethane foam. Convenient pillow storage compartment. Electrowelded base, 4 year guarantee. Orthopaedic spring mattress h cm 14, or made of polylatex foam, with removable cover. Completely removable cover can be selected from our fabric and colour sample book. A team of professionals makes the Michelle sofa bed.